Our dinner party of 8 divided this dessert into 8 portions. Not a lick was leftover! Thank you to Rose Thill for discovering this recipe and to Nadine Kanuch for preparing it so exquisitely! Line a 5-by-9 inch loaf pan with plastic wrap, leaving a 2 inch overhang on all sides. Pulse pistachios in a food processor until coarsely chopped. Transfer to a small bowl. Puree until smooth and transfer to a fine sieve set over a bowl. Stir puree, pressing on solids to extract as much liquid as possible. Discard solids. In a medium bowl set over a pot of simmering water combine egg yolks and 1/2 cup sugar. Beat on high until pale yellow and tripled in volume, about 3 minutes. Transfer bowl to a larger bowl of ice water. Stir until mixture is very thick and cool, about 3 minutes. In another large bowl beat together cream and vanilla until soft peaks form. Whisk 1/3 of whipped cream into egg mixture, whisking until smooth. Then fold egg mixture into remaining whipped cream with a rubber spatula just until thoroughly blended. Pour 1/2 of the cream mixture into strawberry puree. Gently fold together until thoroughly incorporated. Pour strawberry cream mixture into the prepared loaf pan; smooth top. Fold pistachios into remaining cream mixture. Pour evenly over strawberry cream; smooth top. Fold plastic wrap over surface and freeze at least 12 hours. Keep frozen until ready to serve. Invert pan onto a cutting board. Unmold semifreddo, remove plastic, and cut crosswise into 3/4 inch thick slices. Voila! 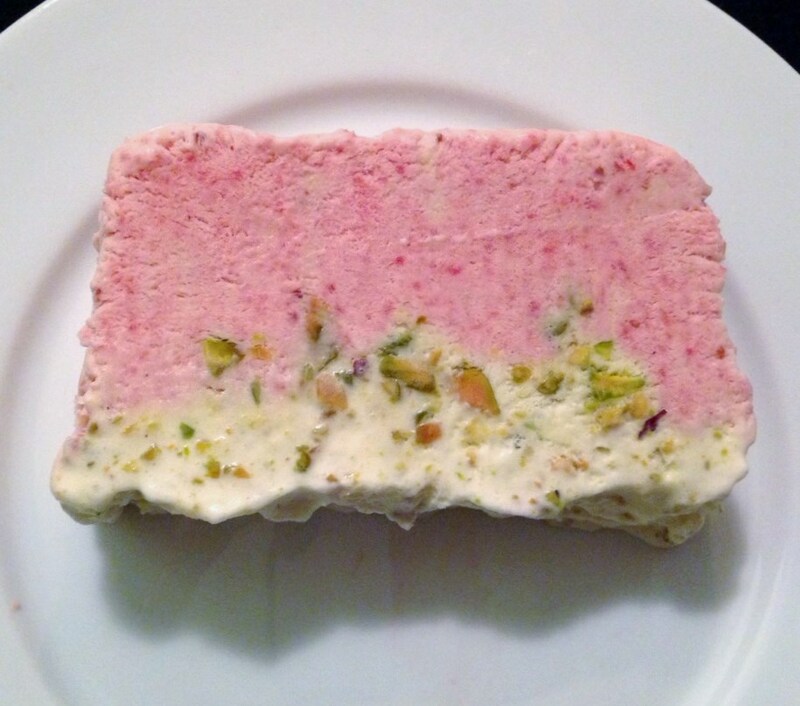 Posted in Cakes and desserts and tagged dessert for entertaining, frozen dessert, ice cream, living, martha stewart, pistachios, semifreddo, strawberries. Bookmark the permalink. We all love Martha Stewart! She is a food icon! I made this dessert for our dinner club last year and had the same reaction. The picture in Martha Stewart living was so seductive I had to try it. It’s one of those recipes that hits on all aspects-visual and taste! Thanks for sharing the beautiful photo! Hi! Your semifreddo recipe was nominated as one of the “Best 300 Semifreddo Recipes on the Net”. To vote for it, please visit http://easyitalianrecipes.org/dessert-recipes/best-300-italian-semifreddo-recipes-on-the-net-vote-for-your-favorite/ – your recipe is positioned at #168 (random order).